It's almost half-term, hard to believe isn't it? Why not pack up the car and head off for a few days to explore a new part of the country. There are wonderful family-friendly options aplenty across the UK, ranging from cosy B&Bs and country house hotels to quirky glamping and luxe holiday houses. Here are a selection of our faves. 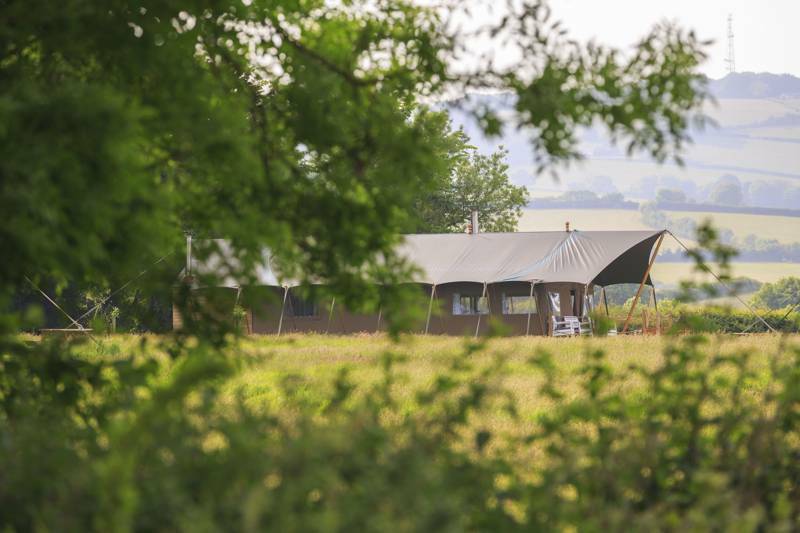 How does a beautiful Somerset site with both glamping and self-catering cottages and your own personal hot tub sound? That's what guests get at Middle Stone Farm. The safari tents are at the upper end of the luxury scale, fully kitted out, most sleeping six, whilst The Deckhouse is a two-bed white-washed pavilion-style cabin in its own corner of the farm, retro in decor, with glorious views of open farmland. Owners Martyn and Catriona took lovingly restored this Grade-II-listed Georgian property in Letcombe Regis, a pretty village in south Oxfordshire, and it really shows. It's a proper pub that serves top-notch food, with eight tastefully decorated bedrooms above. If you're after a family suite, opt for 'Lambourn' or 'Oxford'. Head out on foot with the kids, the area has tons of walking routes; the ancient Ridgeway National Trail is close by. Here you have two double-decker luxe yurts situated on a small Sussex farm; the ideal spot for a family break. Designed and created in Seattle in the shadow of Mount Rainier, they're often used as full-time residences back in the US, and we can believe it. They comfortably sleep five people, in a ground-floor bedroom with superking Hypnos bed and a galleried first-floor space; and they will add a travel cot on request. This enticing Gloucestershire getaway set in the Wye Valley Area of Outstanding Natural Beauty has six stylish, self-catering apartments, each with a spectacular vista. The added bonus of staying at Symonds Yat Rock Lodge is they allow breaks to start on any day, and short stays are fine too. However long you choose, there's no shortage of things to do; owners Darren and Claire are passionate about their local area and keen to tell visitors all about it. Head to Dorset and check-in to this 77 room country house retreat in the New Forest. Right on the doorstep are an abundance of walks, cycle rides and wildlife, plus the hotel itself has a large indoor pool (plus a fabulous spa). On-site restaurant the Cambium is one of the best places to eat for miles around, whilst Le Blaireau is an authentic French brasserie, and the sublime Zen Garden serves excellent Thai food. Sister place the Montagu Arms is located in nearby Beaulieu and worth considering too.